To illustrate the key ideas behind our 13 collaborative case studies across Europe, GAP2 recently commissioned professional illustrator Paul Hampson to capture each case study’s essence in a one-off, original cartoon. 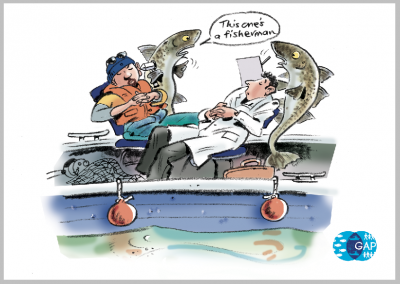 We are delighted to share these cartoons with you here – let us know what you think @GAP2_Project #GAP2Cartoons! 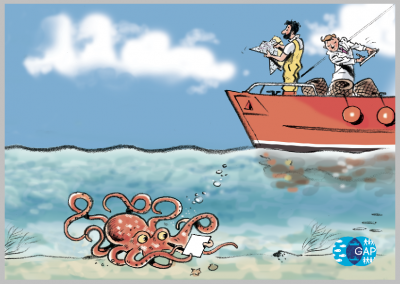 Our Galicia case study is encapsulated in this image, ‘Participatory Pulpo’, which shows participatory mapping – a knowledge-gathering method – in action. In this case, even the ‘pulpo’ (octopus) has joined in! 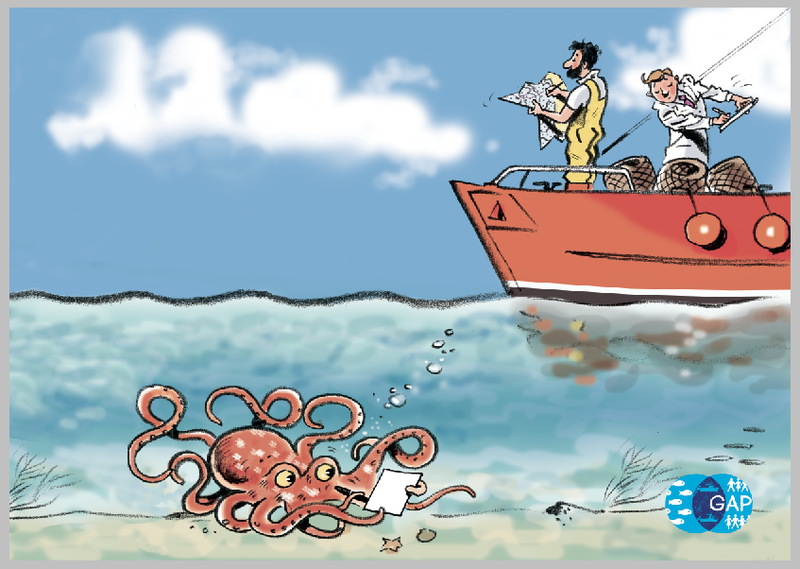 Read more about the Galicia case study, and its work in octopus fisheries, here. 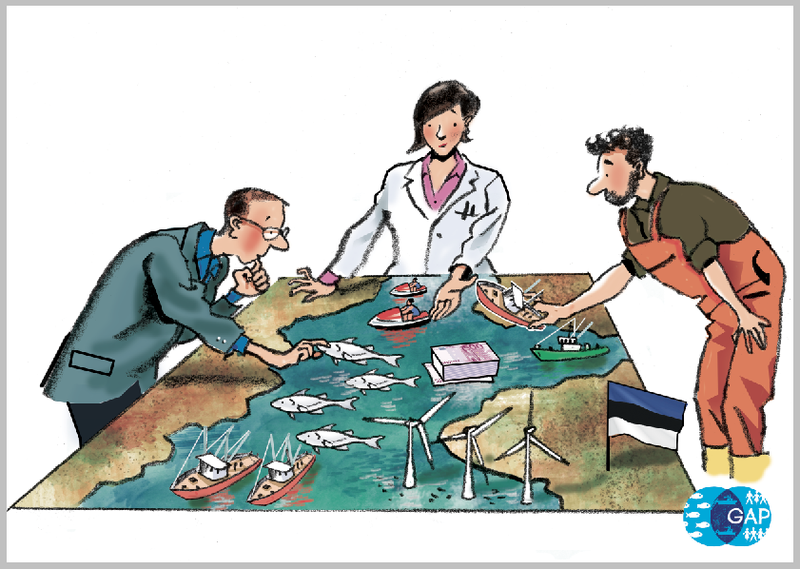 ‘Sharing Knowledge, Saving Sturgeon’ - the Germany case study cartoon – illustrates how fishers insights into species distribution can contribute towards international conservation efforts for key species, part of this case study. 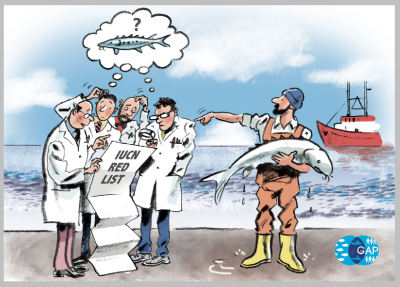 Read more about the German case study in the Wadden Sea, and its work with the IUCN Red List. 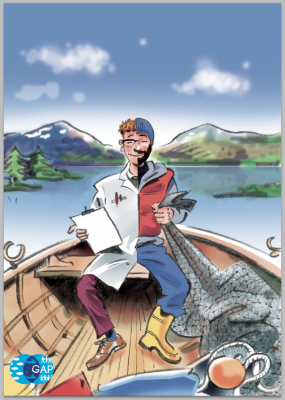 ‘Dual Roles’ shows how fishers in Lake Vättern – where GAP2’s Swedish case study is based – have taken on the role of scientists, gathering data on their fishery, with the aim of increasing sustainability. Fishers in Lake Vättern have tested a number of new trapping techniques on the lake, as well as gathering data on stocks, and the health of the lake environment. Fishers are involved in the design and implementation of research processes. Read more about how fishers have become involved in the scientific process here. 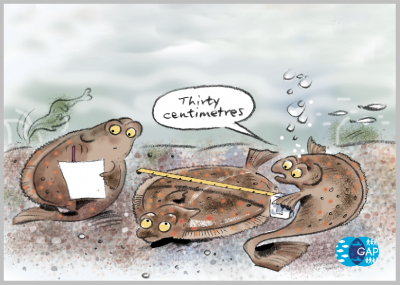 ‘Location, Location, Location’ highlights the role technology can play in innovative fisheries management. In GAP2’s brown crab case study in Devon, an app is being developed to help track the migratory patterns of local crab stocks, and other key stock-assessment information. Read more here. 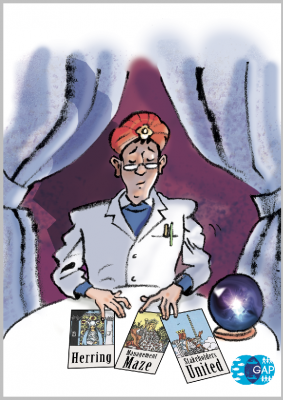 Our case study in Denmark is encapsulated in this cartoon, ‘The Fisheries Fortune-Teller’ which reflects the complexity of predicting herring movements, and the different factors to be taken into account when developing herring stock management measures. Here a scientist in the guise of a ‘fisheries fortune-teller’ attempts to look into the future, whilst juggling complex issues related to stock assessment and management. You can read more about this complex case study here. ‘Maritime Spatial (Participatory) Planning’ illustrates the process that GAP2’s Estonian case study takes part in – that of Maritime Spatial Planning in Parnu County, near Tallinn. 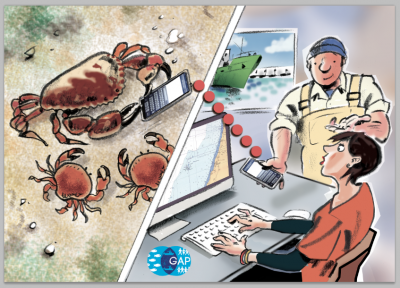 Here, GAP2 supports participation between fishers, scientists and policy makers to ensure all voices are heard in the planning process. 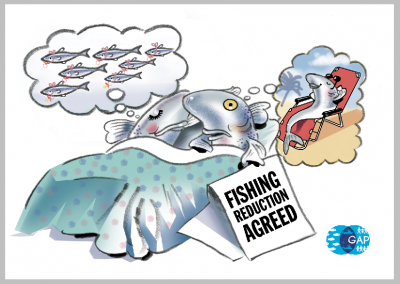 ‘A Fish’s Wishes’ highlights a successful outcome of GAP2’s Italian case study – a fishing reduction proposed by fishers, and agreed with local policy makers. The two fish featured in the image have different ideas of how they’ll spend their time off from the fishing season! Read more about this here. 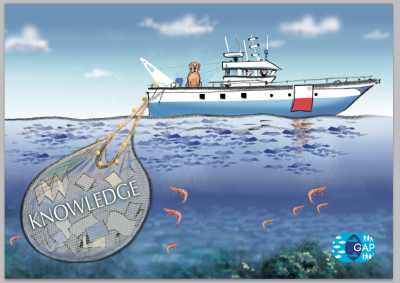 Our Maltese case study is captured in this image, ‘Trawling for Knowledge’ which shows how local fishers – trawlers – are working with scientific partners, and government, to gather knowledge on fish stocks and spawning grounds in the Maltese 25nm trawl zone. Read more about this case study here. ‘Aggregations’ shows a science-fisher aggregation observing a tuna aggregation, and vice-versa! 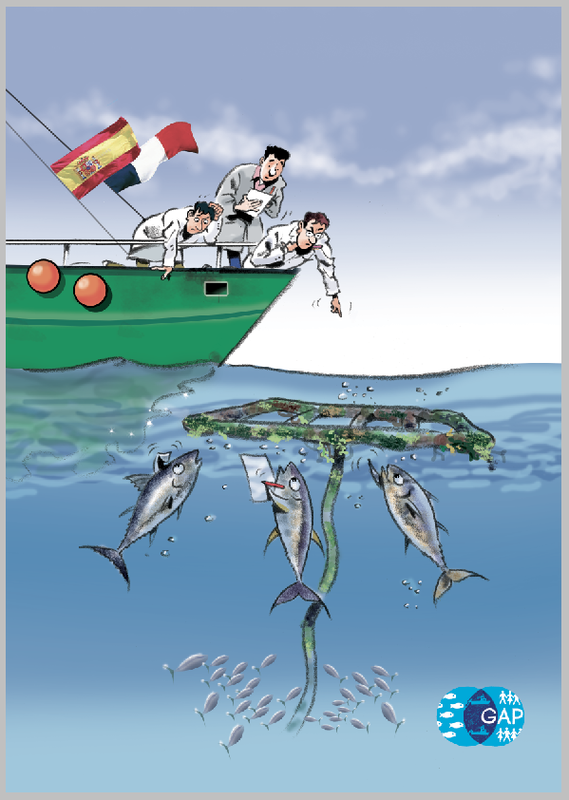 This reflects the work of GAP2’s case study investigating the sustainability of using Fish Aggregating Devices (FADs) in tuna fisheries. This case study includes scientists and fishers from both France and Spain, predominantly fishing in the Seychelles. Part of this work has involved investigating the use of echosounder buoys. Read more about this case study here. ‘Self Sampling’ is a literal take on the term for a technique used widely in GAP2’s Dutch case study. 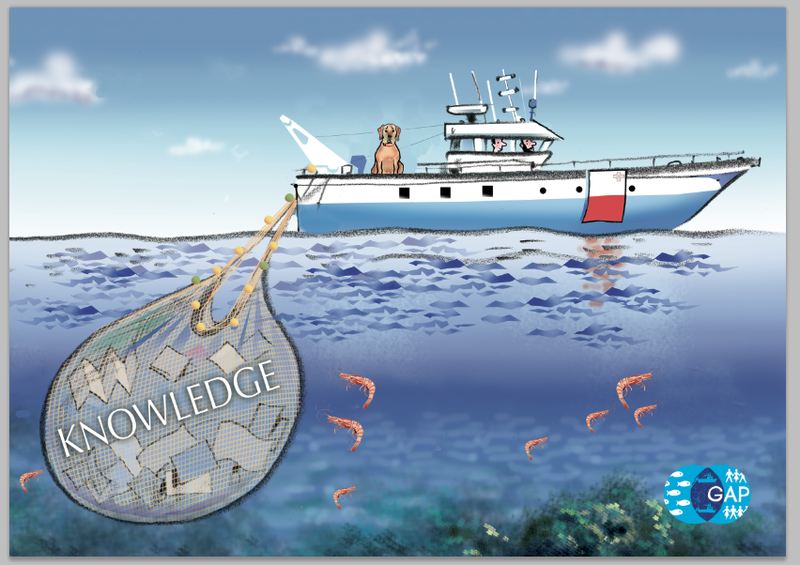 Whilst in this image, Dutch flatfish are literally collecting data on themselves, in the Dutch case study, fishers are trained to sample their own catch, gathering data on discards. Read more about this work, here. 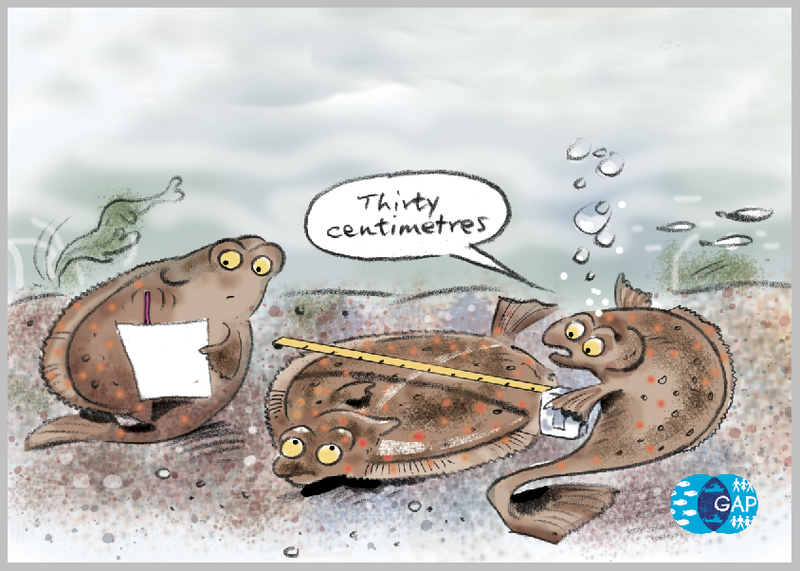 ‘Identifying Species’ highlights the methods used by fishers and scientists in GAP2’s Norwegian case study to identify different populations of coastal cod. This is achieved by examining ‘otoliths’ – or ear bones – in the fish. Read more about GAP2’s work in Norway here. ‘Deep Joy!’ depicts the value of a ‘voluntary closed season’ agreed through collaborative work with scientists, fishers, and policy makers in GAP2’s case study in Palamós, Spain. 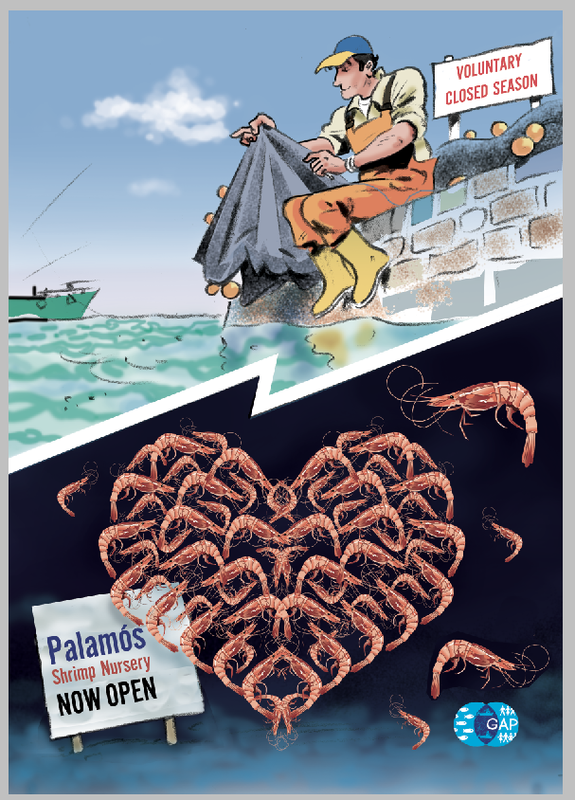 This periodic abatement in fishing will allow red shrimp populations to re-generate, by allowing mature shrimp to reproduce, and allowing juveniles to reach spawning age before being fished.Read more about this agreement, and the important on-going collaboration in Palamós, here. To read a full set of two-page documents on our 13 case studies, including aims and key outcomes, click here. For further information on any of the case studies, or the images above, please contact Communications Manager, Katrina Borrow, on Katrina@mindfullywired.org.